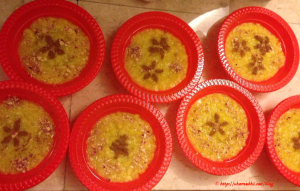 This is a traditional Persian dessert, and it’s easy to make. Its name can be translated as “the yellow soft”! Soak the pudding rice in water over night. Then pour the rice and water in a pot and cook it on low (or at least not too high) heat until the rice is completely cooked and soft. Note that it shouldn’t get too solid, as it’ll get more solid after it cools down, and can make the pudding too hard. Brew some saffron by grinding it, and adding boiling water on it, keeping it in an air-tight jar for some minutes until the colors has turned orange/saffron! Add the brewed saffron, and sugar to the pot and stir well until the sugar is completely dissolved. Then add the almond flakes, rosewater, and/or the cardamom, and stir some more. Pour each portion in a small bowl, and chill it. You can decorate the pudding with ground almond, or cinnamon or rose petals. Note: I have not mentioned the amount of sugar and saffron for this, as it differs for each taste. If you make it with brown sugar, you may add some more, compared to white sugar. Also remember that it won’t taste so sweet while it’s hot, so do not add too much sugar, since you may find it over-sweetened once it’s chilled. Taste it while cooking, and adjust the amounts. Rosewater and/or cardamom can add extra flavor/odor. Personal Note! I love adding a lot of cinnamon powder to this pudding while eating it. It turns brownish, and you may not like how it looks, but it does taste so good.